There’s nothing more frustrating for a gardening business than having a customer that won’t pay their bill. If this happens to you, what can you do about it? When you’ve worked hard to fulfil your side of a business deal and have provided your professional services or products, it’s not pleasant to then discover that a customer isn’t paying. 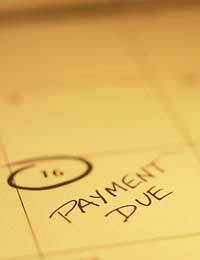 Sometimes non-payments can be due to simple misunderstandings, or if an invoice gets mislaid in the post. But sadly on other occasions, you’ll encounter people who refuse to pay for no good reason. It can be a hard situation to deal with, especially when you need the payment to be made to help you fulfil your business expenses and bills. In the first instance, you can phone and write to the customer letting them know that their payment is late and giving them a deadline by which to pay. Be prepared that you may need to follow this is up with a final warning letter, after which you could call in the services of a debt collection agency to help you collect the payment. If you’re not a large business and don’t think you can afford debt collectors, don’t panic. There are some solicitor firms that specialise in helping small businesses collect debts and unpaid invoices and only charge a minimal fee for sending out Letters Before Action (the first warning letter) and summons to Small Claims Court. If a customer disputes the invoice, or isn’t prepared to pay the full owed amount, then do see if you can reach a compromise before taking further action. There’s no tried and tested way to completely prevent late payment issues from ever occurring, but there are practical steps you can take to try and reduce the risk of it happening. Before you agree to a job that involves your gardening services, knowledge or products, sort out payment terms and cost with the customer. If you’ve never worked for them before, or it involves a large cost, then consider charging a part-payment in advance, so you won’t be completely out of pocket if things go wrong. When you issue an invoice, always put details of when payment is due, so that the customer knows exactly when the bill should be paid. For example, you could use the wording, “Payment is due 30 days from the date on this invoice.” In case customers claim never to receive the invoice, you could send via two methods, such as email and post, or by delivering it yourself, so claims to receive it would be unlikely. You should also always make it clear exactly which payment methods you accept – cash, cheque, BACS, credit card or debit card – and give key contact information for each of these payment methods. Under the Late Payment of Commercial Debts (Interest) Act of 1998 and 2002, all businesses in the UK are able to claim interest on late payments and claim reasonable debt recovery costs. The amount you’re able to claim varies according to the amount of unpaid debt. For example, on bills of up to £999.99, you can charge a £40 late payment fee. @Andy - it seems a bit of an excessive reaction. You would have to take this to the small claims court. However, there is no guarantee you would win as presumably he will want to claim the job was poor quality. Built a wall and steps using around 500 bricks and a small amount of paving,on the last day the customer said he would electronically wire the money owing,we left the site and in the aftrenoon received a text from his friend to say he's demolished the walling and lifted the paving because he isn't happy,he hasn't paid anything we've paid for the materials ourselves,he said we can come and have the bricks back,but no good to us as they are smashed and have mortar stains on them.